Speak Your Peace was originally developed by the Duluth-Superior Civiity Project and the work of P.M. Forni, professor at John Hopkins University and has been generously shared with the Door County Civility Project as well as other civility projects across Wisconsin and nation. Volunteers with the Door County Civility Project have created ten short videos. One is an overview of the DC Civility Project and its beliefs, goals and activities. Nine additional videos each discuss one of the nine tools of civility in the Speak Your Peace program. Each video may be used independently as a discussion starter in your family, work place, or organization. However, we encourage viewers to take a look at all nine. The tools are inter-related and the skills build on one another. ﻿Beginning in 2015, Civility Project volunteers worked with Southern Door County School District staff to develop simple activities and classroom discussion guides around each of the nine tools of Speak Your Peace to not only promote a culture of civility within schools, but also to prepare students with tools for future civil engagement, whether it be the workplace, military or as they pursue further education. 1) A definition – What does practicing the specific tool mean? 2) Looks Like, Sounds Like, Feels Like documents; a blank template for a teacher/adult to complete with a group of teens and a completed chart to provide the teacher/adult with prompts. 3) A list of open-ended discussion questions and several scenarios for discussion. All scenarios can be used as written or adapted to a specific group, environment or current event. Door County Civility volunteers have included lists of books we have found helpful and relevant to our study of and discussions around civility. The League of Women Voters of Door County has prepared this helpful guide for effective communication with elected officials. 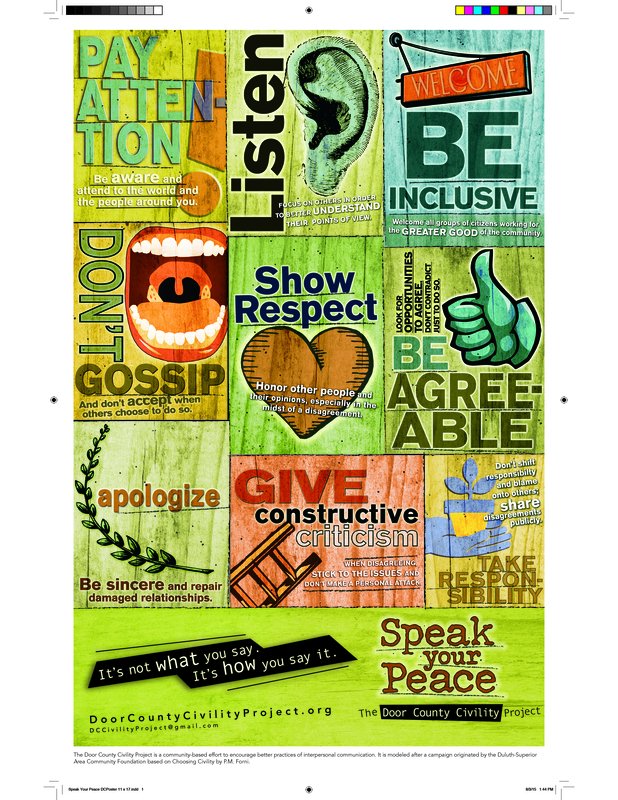 ​The Door County Civility Project worked with the Door County Schools to create banners for display in gymnasiums and sports fields to promote good sportsmanship by all in attendance at events. BE A FAN, NOT A FANATIC! ​Jim Adams, a Sturgeon Bay School Athletic Coach, shares a short and pertinent message.